Bailey was the case of the week in early December after he was diagnosed with lymphoma of the lymph nodes at the base of the heart. We lost Bailey on Valentines day after several months of chemotherapy. We have people that come into the hospital all the time that tell us about their great dogs and most of the time they are right . . . they do have some great dogs. However, lot's of the time people come in and tell us that they have the "best dog in the world". I always try not to laugh because I know how foolish they are since I have the best dog in the world . . . and this is him. Bailey is the best dog in the world even though he does like Mary better than me. I won't hold that against him. How could I? After all he's the best dog in the world and that's saying something! Bailey has save a ton of lives as a blood donor at the hospital. The last time I counted it was over 30 (Noble dog Prize in Medicine?). Bailey had helped teach over 2000 kids to read as he delivered books for Reading is Fundamental (Nobel dog Peace Prize?). Bailey stays to the bitter end of balancing the books at Four Paws every night (Nobel dog Prize in Economics?). He understands the laws of gravity better than most since his healthy weight is 125 pounds (Noble dog prize in Physics?). In the past few years he has had a few problems. A torn cruciate ligament in '97, mast cell tumor in '99, Gastric Dilatation Volvulus in '99 and a nasty invasive lipoma earlier this year. However, he as continued to be a wonder pet and blood donor providing life saving transfusions 3-4 times already this year. It is never with happiness that I look at a slide and see what I see here. That is especially true when it involves the best dog in the world and when that dog is my dog. 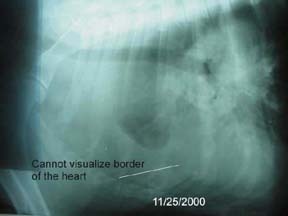 However it is sometimes helpful to have what I will call a diagnosis even if it is a bad one. We have to know what the problem is before we can start doing things to help. 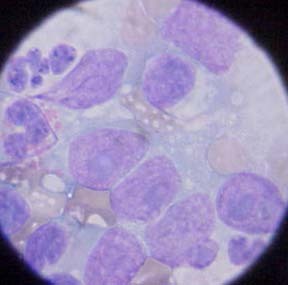 The big purple and blue cells present with the blue circular structures (called nucleoli) probably represent juvinille lymphocyte that are multiplying in an improper manner as are seen in lymphoma. 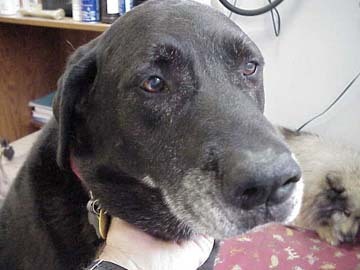 We have started chemotherapy on Bailey as of 11-25-2000 and I will try to keep you posted with regard to the progress. We plan on using Prednisone, Vincristine, Cyclophosphamide and Doxyrubricin though I am still in the process of trying to determine the best protocol. Update 11-27-200. Bailey is doing well after his first few doses of chemotherapy. We have not given of the toughest of the drugs yet and with chemotherapy our biggest problem is the cummulative affects of the various drugs. However, I would say that it is still good to see him have an appetite that hangs in there and see him still bright after his first few treatments. The protecol that we are using goes on for almost 5 months so we've got plenty of bumps in the road ahead of us. Our initial order of drugs should arrive tomarrow so we will probably go ahead and give doxyrubicin as soon as it gets here. We do chemotherapy but most of our clients have not chosen to use some of the drugs that are a little more expensive though they do probably improve survival times. 11/28/2000 - Have given first dose of doxyrubicin. This was my first experience with the drug and the ADMINISTRATION could have gone better but Bailey seems to have handled things OK for now anyway. We will be monitoring lots of things to see how severely it affects him but one of the important things is the wag factor and we still seem to be able to get a wag out of him! 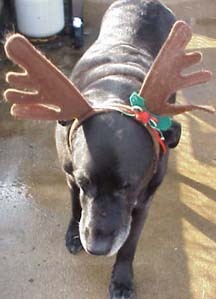 Baily's had a fairly rough week of chemotherapy but was still willing to pose with his antlers on. Over the years Baily has "had to" wear them as a prop for his book giveaway and has always been a hit. I wouldn't say that he likes it but he doesn't hate it anyhow! For the most part Bailey's treatment has gone OK. Mid week (12-1) he lost his appetite and spiked a fever. He had gotten his Adriamycin (doxyrubicin) the day before and that may have contributed. We also wondered if infection could have been a problem though other than the fever we could not find any direct evidence. His appetite seems to have come back and he continues to go to work with Mary every day. His spirits are high and he has not yet reached the point where he hates to go to the hospital for his therapy. He does get lots of treats each time and, last but not least, he enjoys watching some of the other dogs have to go be blood donors while he lounges around avoiding THAT work.! Valentine's day proved to be a very sad one for us at the hospital. We have seen that Bailey had been slipping for a little while despite the chemotherapy. We had skipped some treaments because of how he was handling it. Yet, this is part of the old "rock and a hard place" senario. At any rate, there was a rapid decline on the morning of the 14th. and Bailey was starting to show real signs of distress. Mary and I lost our second pet in less than a week to cancer around 11 AM. Bailey was a really special dog for many of us. I've mentioned his life saving heroics in the past so I won't need to go into that. Mary has had his company at Four Paws since the day it opened. I can still see him and his sisters lying by the side of the road in Easley where we found him. It just won't be the same without him. We knew when we started the chemotherapy that we did that things looked pretty rough. 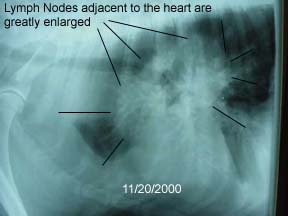 The chest cavity was already filling up with fluid and the location of the tumor and Bailey's size were statistical negatives. I am more ready to lose him today than I would have been 3 months ago but I am still disappointed that we only had him this long. Bailey was 11 years old making him the youngest animal that we've lost here. 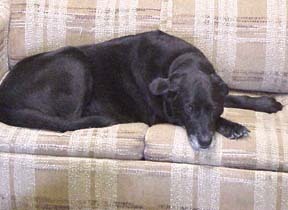 Bailey is the fifth of five dogs that we've lost that succumbed to cancer.